New rush hour tolls on Interstate 66 express lanes inside the Beltway are bringing in millions of dollars of revenue, and the number could soon reach $12 million by the end of June. News4 learned those sky-high tolls during rush hours have netted $6.1 million in just four months. This sum was collected from December 2017, when the tolls began, to March 30. Some tolls have even gone as high as almost $50 for a one-way trip. Traffic has become so bad along the entire stretch of the highway some drivers avoid it completely. The uncontrollable congestion is why the Virginia Department of Transportation (VDOT) is giving drivers the option to pay for a speedy commute, even during rush hour. 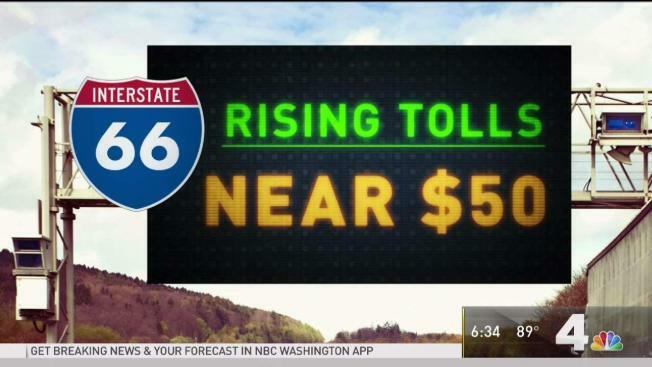 The tolls inside the Beltway have increased from $10 to up to almost $50. "I was there on the third day that they opened it and got hit for forty bucks. Since then, its been $17 to $23," one driver Will Washington said. Washington said he feels the cost is justifiable only when it’s urgent. The Virginia Department of Transportation projects that by the end of its fiscal year, or June 30, the tolls will bring in $12 million. Half of the toll revenue it collects will go back toward transportation projects in the I-66 quarter. The rest will cover HOV enforcement, maintenance and operations. Two more express toll lanes are coming outside the beltway that will be added in each direction. "We are starting to shift lanes and install concrete barriers, so that we can put our work zones in place," VDOT representative Michelle Holland said. Road crews said it was obvious things could not stay as is.